While it doesn’t necessarily work for everyone, giving a child an allowance is a common tool parents have used for ages. Whether the motive is to provide children with an incentive to do their chores, educate them in financial literacy or just to give them a little spending money, an allowance can serve many purposes. If you’re thinking about giving your kids an allowance, or are already paying them a set amount, make sure you’re getting the most out of your money. After all, your children are your most important investment, right? Right? Like any investment, you need to do your due diligence and make sure your money isn’t going to go to waste. You can do this by educating your child about money before actually handing over any. If you want to allocate some money to your son or daughter as soon as possible, you could always deposit it in a child savings account first before you put it in their hands. It’s important for children to learn about the value of money before they actually have any. As adults, sometimes it’s easy to forget that it took most of us our entire lives to learn what we know now about being fiscally accountable. Remember that your kids really don’t know anything about money except that it’s green, it’s paper and it gets them what they want–probably toys and candy mainly. Easy Come, Easy Go: Money doesn’t come easy and it’s important your children understand this from the get go. You work hard for every dollar and so should they. The more effort they put into earning their money, the harder it is for them to waste it because they know what it will take to get more. A Penny Saved is a Penny Earned: It’s important to know how to earn money, but even more so how to keep it. Once your child understands the value of money, help them learn to save it by shopping frugally and maximizing discounts. The more they get from their dollars, the more they’ll want to learn to earn. Make Your Money Work For You: Yes, the concept of investing may be beyond your child’s comprehension at this age, but if you can simplify it enough, you can give them a very early head start to becoming financially savvy. 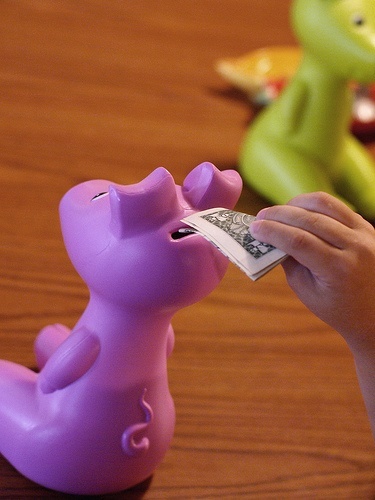 Instead of a piggy bank , let them store their money in the Parental Savings Credit Union with a generous savings rate. Sure, you’ll have to pay a little extra to your children when the principal is compounded, but the dividends you’ll collect as a proud parent of a financially responsible teenager or young adult is well worth it. Allowances aren’t mandatory, of course. If you don’t feel like that’s the right parenting strategy for you, then that’s all fine and good. However, if you are going to give an allowance, make sure you’re using it for positive purposes. It’s just as easy for parents to be irresponsible with money as children and if the right re-enforcements and education isn’t in place, you run the risk of planting bad seeds and habits that could take years or decades to reverse when your children become adults and that’s something no parent should allow. Great post. I dont have kids yet (but plan too!) and I think the only thing I would add is Tithing or Giving. I want my children to understand the value of money, which I believe involves being a good steward of it. There are a lot of different philosophies and approaches when it comes to allowances. I don’t think there’s any one right way, other than to make it consistent and to keep it positive (i.e. avoid instilling negative money associations). I like your comment about hard work. Personally, I like my daughter to not only enjoy my praise for her hard work on chores, but the satisfying feeling of being paid for work above and beyond basic requirements. My opinion is that she is more apt to hold on to that money when she thinks about how much work she had to do in order to earn it! From time to time we’ve toyed with giving our kids’ an allowance but have never been consistent with it. I think that is where we dropped the ball. In hindsight I wish we had selected an appropriate amount based on our family’s finances and stuck with it. I used to just hand money over to my 5 year old for those small toy machines on the way out of the supermarket. I didnt like the expectation that it developed in her, though. While I havent cut off the small treats she now knows that she will need to help out with chores and work in order to earn that money, just like dad does! @ Mike – I was in the same boat with my four year old. The solution I eventually came up with was to pay $1 of his allowance in quarters and let him spend that on the toy/gumball machines if that’s what he chooses. LOL – but he doesn’t get to spend MY money on the machines. One of the challenges is sticking to the terms of the allowance. As with everything else you must have the discipline and willpower to apply the rules consistently, no matter what happens.